The Rockford IceHogs were deep on the defensive side in 2018-19. It was in this area where the club had an abundance of experience to start the season. It only got better in the spring as some key pickups further strengthened Rockford on the way to a long playoff run. Back with a look at the back end of the roster, here are my thoughts on the defense. 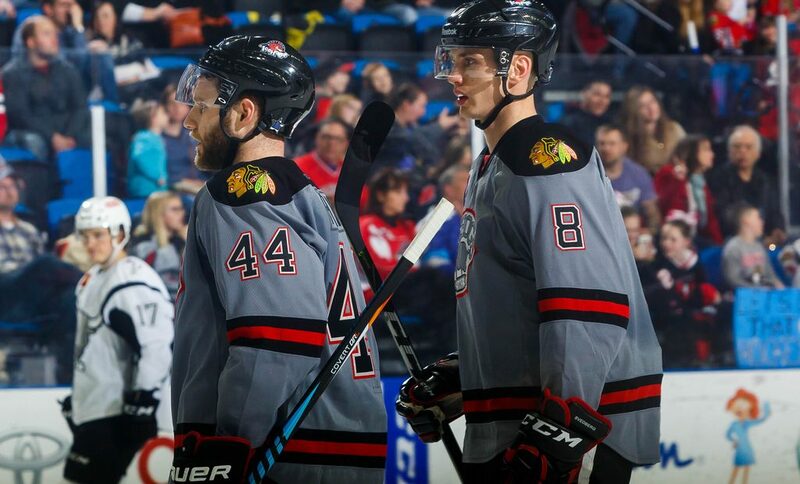 The addition of these two veteran blueliners completely changed the course of the IceHogs fortunes. The power play went from being a laughing stock to the most dangerous in the AHL. Franson performed like you would expect a NHL-level talent to upon arriving in Rockford. The 30-year-old Franson immediately became a locker room sage and offensive catalyst, with six power play goals in the regular season, then four more in the playoffs. A point a game player in the postseason (6 G, 7 A), Franson totaled 15 goals and 41 points in 50 games in an IceHogs sweater. Clendening, who was returning to Rockford after stints in several other organizations, saw his scoring touch return in a big way. After five points in 21 games for Tuscon to begin the season, Clendening went on a tear and wound up leading all Hogs defensemen in scoring despite joining Rockford well into the season. Franson was quite open about his future (or non-future to be more accurate) in the organization past this season. His steamrolling through the AHL might open a few doors as an unrestricted free agent this summer. On the other hand, Clendening is an RFA and could be re-signed at low cost to the Blackhawks. The question is, will Chicago tender an offer to a player who couldn’t secure an NHL spot in the organization in his first go-round? Clendening would be a nice piece to start building next fall’s Hogs roster; we’ll see what transpires in the next couple weeks. The 6-9 Swede began his time in the organization as a project; Svedberg is now a UFA following his fifth season, most of which was spent with the IceHogs. This was easily his best season from an offensive standpoint. He also potted a couple of big shootout goals when called upon. Svedberg began the season healthy and stayed that way, playing a career-high 73 games. For a guy who had trouble staying on the ice in past years, it was satisfying to see him showcase his game. Svedberg still gets a bad rap from some Rockford fans for his defensive liabilities, which were on full display for most of his first three seasons. That’s too bad, because he was arguably the IceHogs best defender this year. I could count on one hand the number of times that Svedberg was caught out of position in his own zone, leading to an open shot attempt. He is never going to be a player who can use his skating ability to get him out of trouble. However, he has learned to take advantage of his reach and positioning to be effective. Svedberg was often an alternate captain (coach Jeremy Colliton never named a captain this season) and was one of the few skaters (before DiDomenico and Lance Bouma showed up) willing to stick his nose into a scrum. When Franson arrived, Svedberg completed a very solid (and physically imposing) top pairing. Svedberg has come a long way in five years and certainly could provide some organizational depth and leadership in Rockford. It will be interesting to see what offers he fields in free agency. 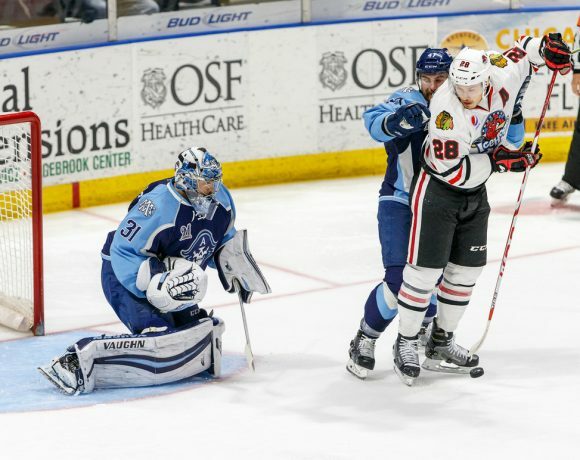 Dahlstrom was a substitute for Erik Gustafsson in the AHL’s All-Star Classic and took his game up a notch in his second full season in Rockford. Dahlstrom was a steady defender and took a bigger role at the other end of the ice in 2017-18. He looked a lot more confident bringing the puck out of his zone this season and earned a stint in Chicago late in the spring. It seems likely that he is in line to earn a spot on the Hawks roster in training camp the way things look right now. Franson and Clendening altered the pecking order among the defensemen; Dahlstrom definitely had a reduced role on the power play. His shot attempts at even strength took a hit as well, with a drop in frequency of about 23 percent after he came back from Chicago in March. Dahlstrom last drew cord for the Hogs on January 13. In his last 26 regular season games with the Hogs, he managed just nine assists. Dahlstrom rebounded in the playoffs with three goals and six helpers. The other player most affected by Franson and Clendening’s presence was Forsling. When he was sent to Rockford in January, he scored in his season debut with the Hogs, then went dormant offensively. Once the vets joined the team the next month, there wasn’t much of an offensive role for the 21-year-old. Forsling got some time quarterbacking the second power play unit. He had one assist on the man advantage in the regular season and another one in the playoffs. He was a bit more noticeable in the postseason, with a goal and five helpers. However, most of his time was spent on the bottom pairing. Forsling did not distinguish himself on the scoreboard in his time in Rockford. At the same time, he didn’t defend very well either, at least in my opinion. Had Forsling had a more prominent spot in the lineup, he might have picked up his play in the latter part of the season. That didn’t happen. Raddysh had the biggest impact of these three players, earning himself an NHL entry deal from Chicago last month. He found himself in the lineup over several players with NHL contracts this past season, something that also held true nine times in the playoffs. Snuggerud’s rookie season was interrupted for two months after suffering an upper body injury December 8. He had a pair of goals and eight assists after returning in February, but did not suit up in the postseason. Norell’s campaign began with a savage beat-down at the hands of Brett Gallant in Cleveland opening night. It ended in the press box in the postseason. After a four-game point streak in December, Norell went 43 games without a goal or an assist until getting a goal in the regular season finale in Chicago. This, despite playing as a forward for much of that time with line mates who regularly found the net. His defensive play at forward was often praised by Colliton, though apparently not enough to get him on the ice at any position in the playoffs. Norell skates hard, but isn’t a real physical player and isn’t gifted with a great shot. It may be hard for him to find time on the blueline this fall. Ville Pokka (4 G, 18 A) played 46 games in Rockford before being traded to Ottawa for Chris DiDomenico. Pokka was perfectly serviceable for the Hogs but was spinning his tires in the organization. The return on the exchange was a vital part of Rockford’s late season success. Gustafsson (3 G, 14 A) was with the Hogs for 25 games before spending the remainder of the season in Chicago. Joni Tuulola was scoreless in two regular season games and four postseason appearances. Also putting up goose eggs in limited action in 2017-18 were AHL contracts Brandon Anselmini and Robin Press, who each got into seven games. Former Hog Nolan Valleau was brought in on a PTO for three games and then released. Where Does The D Go From Here? Chicago has added Dennis Gilbert, Lucas Carlsson and Henri Jokiharju to the list of prospects on defense. With Tuulola set to begin his rookie season and five holdovers, the position is crowded even without a veteran signing like Clendening or Svedberg. As is the case at every position, the next month will surely see some turnover. The blueline will certainly be a lot younger in 2018-19. 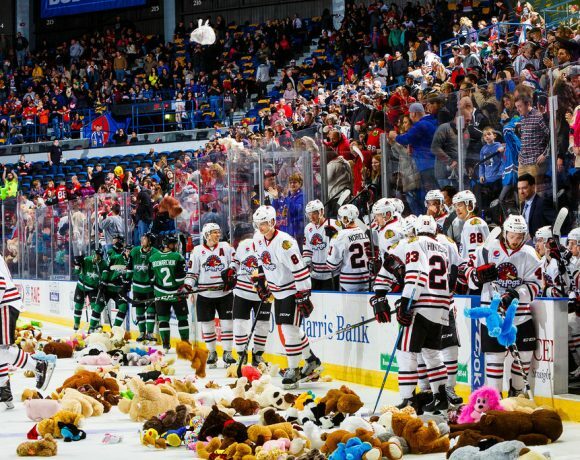 This week, I hope to start sifting through the forwards in one additional installment of my year-end look at the IceHogs. Follow me @JonFromi on twitter for thoughts on the Hogs throughout the summer.